Just days after four-foot wide speed cushions were installed on a Palos Verdes Estates street, a 65-year old cyclist went down hard. So hard, in fact, that he was still unconscious a week later. Yet local authorities say they can’t “conclude without a doubt” that the cushions were at fault. But it’s highly likely that a jury would — and no doubt, eventually will — conclude otherwise. And that’s the problem. When what seems like commonsense roadway solutions are applied without consulting the cycling community — or at least, traffic engineers who actually ride themselves — it’s not just your safety that’s at risk. It’s your tax dollars, as well. Because the inevitable lawsuits that follow are either paid out of your tax dollars, or through a government insurance policy that’s paid with your tax dollars. And one that can often increase, sometimes dramatically, following a successful lawsuit alleging negligence. In the Palos Verdes Estates case, Richard Schlickman, described as an experienced cyclist, skidded nearly 80 feet after losing control when he either hit one of the newly installed speed control devices on the 500 block of Via del Monte, or swerved to avoid them. According the Daily Breeze, an unidentified cyclist who witnessed the incident said the speed cushions were the cause of Schlickman’s wreck. The Daily Breeze goes on say the police believe his speed may have been a factor. The police report said Schlickman’s wreck was caused by the cyclist’s speeding between 25 and 28 mph, above the 15 mph limit posted near the new speed humps, said Robinson of the Palos Verdes Estates Police Department. However, the photo that accompanies the story clearly shows the 15 mph speed limit sign has a yellow background, rather then the standard white, indicating it’s an advisory, rather than mandatory, limit. Which is something you’d think the local police would understand. In addition, the sign is located directly next to the speed cushions, providing inadequate warning for cyclists. While most drivers could brake quickly enough to slow down to the recommended 15 mph speed, a cyclist travelling downhill at 25 mph would have a much more difficult time slowing that quickly without losing control. And even then, 15 mph could be too fast for many cyclists to safely traverse the multiple-inch high humps. So without advance warning of the speed cushions, what would merely be a minor annoyance to most drivers could be a deathtrap to bike riders. According to the article, the cushions were installed with the best of intentions, as local residents were concerned about speeding drivers, as well as cyclists; in fact, 91% of residents approved the installation. Maybe the other 9% were bike riders, who could have predicted the inevitable outcome. Had the city consulted with cyclists before installing a device designed strictly for motor vehicles, they most likely would have been forewarned about the obvious dangers. Instead, an experienced cyclist is suffering from a serious brain injury. And when the inevitable lawsuit is filed, the attorneys will have no problem pointing the finger at those responsible. Of course, one of the primary factors involved in assessing liability in a case like this is proving that the party responsible knew, or had reason to know, of the danger. In this case, Palos Verdes Estates clearly failed to do their due diligence in assessing the danger to cyclists prior to installing the speed cushions. In other cases, such as the dangers posed by potholes and other road hazards, liability often comes down to whether the government agencies concerned were aware of the problem prior to the injury. Take the rutted moonscape left behind by the so-called Hudson River on heavily biked 4th Street. Bicycle Fixation’s Rick Risemberg has filed numerous requests with the city to have it fixed, which meets the requirement for ensuring they are aware of the problem. And there have already been injuries — plural — to cyclists as a result of those dangerous conditions. 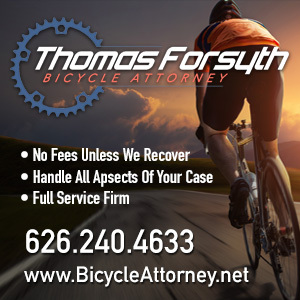 Which means the next cyclist injured there should have no problem proving his or her case. I’ll be happy to testify to the risky maneuvers required to avoid the danger spots, which can easily take down a rider or force them into the path of oncoming cars. And something tells me I won’t be the only one. The same thing goes for eastbound Ohio Ave west of Sepulveda Blvd, the West L.A. Bikeway through Westwood Park, and Wilshire Blvd between Westwood and Beverly Hills. All of which I’ve reported myself at one time or another. And none of which have seen the slightest effort to repair. Then there’s the intersection of Ohio and Manning Avenues, where frequent running water washes out the asphalt, leaving deep pits in the roadway. It’s been patched — usually badly — at least a dozen times in the 18 years I’ve lived in this neighborhood. Yet as far as I’ve seen, no effort has been made to identify and repair the root problem to keep the potholes from reappearing a few weeks later. Which suggestss that the city is well aware of the problem, but chooses not to fix it. And that means you’ll be the one who pays if someone gets hurt as a result. Whether you’re the one who’s injured. Or stuck with the tab afterwards. On a related note, the LACBC has launched the Good Roads Campaign to catalog road hazards and report them to L.A. Bureau of Street Services. They may want to start with the one above, even if it is just a little outside the city limits. Best wishes to Richard Schlickman for a full and speedy recovery. And a belated thanks to Jim Lyle for the heads-up on the Daily Breeze articles. Update: Jim Lyle notes in the comments that there are now large warnings of the speed humps painted on the pavement; hopefully, that will be enough to keep riders safe. I meant to include this link in the recent report on the New York bikelash, as Steve Vance of Stephen Can Plan writes that he’s keeping track of Brooklyn’s bike lane drama as well, because the same fight could soon come to Chicago. Meanwhile, a Lower Manhattan newspaper goes against the tabloid bikelash to support bike lanes, public plazas and pop-up cafes. Bicycling offers a recap of the New York bikelash, as well as a look at Brooklyn’s upcoming Red Hook Crit. And after 10 cyclists were ticketed for violating a 15 mph speed limit in Central Park, NY officials fall over themselves to disavow it; maybe they’re just making it up as they go along. The planned CC City Council discussion of a motion to weaken Culver City’s newly adopted bike plan — replacing bike lanes on Washington Blvd with sharrows and allowing the City Council to override the plan — has been postponed while council aides study the proposal. 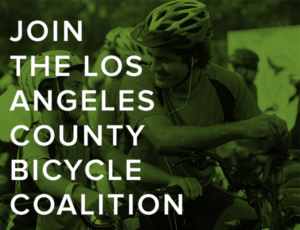 And LACBC affiliate Culver City Bicycle Coalition hosts their monthly Family Ride this Sunday, March 27th, along with a special ride on Saturday, April 16th to look at improvements for the recent Safe Routes to School grant. The LACBC memorializes Mark Bixby, and joins calls for naming the new replacement for the Gerald Desmond bridge — or at least the bike lanes on it — in his honor. And the survivor of that plane crash, cyclist and commercial real estate CEO Mike Jensen, is expected to make a full recovery. 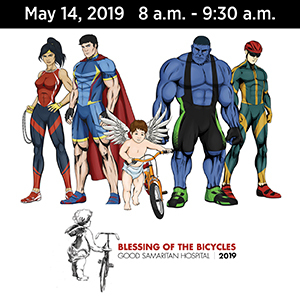 Meanwhile, the annual Long Beach Bicycle Festival that Bixby founded will take place on Friday, May 13th and Saturday, May 14th in Downtown Long Beach. The festivities include the Tour of Long Beach on Saturday, May 14th, with rides of 4, 31 and 61 miles to benefit Miller Children’s Hospital Long Beach. KCET offers a great history of bicycling in Los Angeles. Architects consider a bike-friendly L.A. Council President Eric Garcetti launches a program offering up to $2,500 for neighborhood improvement projects within his district. LADOT Bike Blog looks at chicanes, my favorite traffic calming method to ride. The LookOut News profiles LACBC affiliate Santa Monica Spoke. Santa Monica is looking for artists to design and build functional bike racks. REI Santa Monica hosts a talk by Dominic Gill, who’s travelled the US on a tandem, inviting strangers to hop on the empty seat; 7 – 8:30 pm Thursday, March 31st at 402 Santa Monica Blvd in Santa Monica. 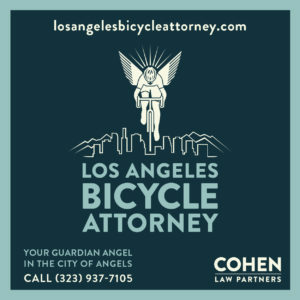 Hearings are announced for L.A.’s proposed new bike ordinance; Writing for Flying Pigeon, Rick Risemberg says the bike parking plan is half-a step-forward. Two former USC students turn college poverty into a booming L.A. based bike business. The conflict between equestrians and mountain bikers that threatened to derail L.A.’s bike plan spreads to Malibu. How to have a bike lane that requires removing parking, without removing parking. Rancho Santa Fe gets its first bike shop. Long Beach’s biking expats encounter just a little mud on their way to Ventura. San Francisco’s successful Sunday Streets — their ciclavia — offered space for a four-person bike and a three-wheeled piano. The Amgen Tour of California prepares for winter weather on the tour’s opening stages; speaking of which, Tahoe-area artists are invited to create art out of bicycles for an installation in conjunction with the tour. There’s a special place in hell for anyone who’d steal the bike from underneath a man with cerebral palsy; fortunately, there are still caring people in the world to make it right. Marin County improves bike detection at 31 traffic signals. Visalia business owners oppose bike lanes after apparently concluding that cyclists don’t spend money, even though Texas cyclists say biking is good for the local economy. The feds are looking for feedback on a proposed rule to improve vehicle rear visibility and reduce back-up collisions. How to booby trap your bike to deter thieves. Tucson hosts their second ciclavia this Sunday; Tucson Bike Lawyer says it’s in his neighborhood. If you’re going to assault a cyclist on his way into work, it’s probably better to make sure he’s not an off-duty cop; Digital Dame asks if the driver is a Christopher Thompson protégé. Oregon Representative Earl Blumenauer talks bikes. A Vancouver WA city council member displays typical ignorance of roadway economics, opposing a road diet and bike lanes “because bicycles don’t pay gas tax or license fees.” Six bikes worth $40,000 were stolen from Austin custom bike builder KirkLee Bicycles, including one featured in Bicycling Magazine’s Dream Road Bike of the Year competition. Cambridge MA installs free bike repair stations for cyclists. As London’s large trucks continue to take their murderous toll, a new augmented reality campaign tries to do something about it. The UK cuts gas taxes for motorists, and at the same time, threatens to eliminate a program to encourage bike commuting. Now that’s what I call a fat tired bike. UCI appeals Spain’s decision to clear Alberto Contador on doping charges; 11 major teams consider breaking away from UCI to form their own super league. Riding the 2012 Olympic mountain bike course. Rookie racing phenom Taylor Phinney of BMC Racing withdraws from his first WorldTour race due to continued knee problems. Japanese cyclist Kazunari Watanabe competes despite the destruction of the home he grew up in. A group of seven Estonian cyclists were kidnapped while riding in eastern Lebanon. A Japanese father who escaped the tsunami by bike looks for his family, who were stuck in traffic when the waves hit. Finally, TreeHugger offers 12 ways to carry a dog on a bike — almost guaranteed to make you smile. And after the recent item suggesting a freeway-riding cyclist may have caused a collision on the 110 Freeway, reader Christelle reminds us of this classic Crimanimalz video. One last note — frequent bike blogger and friend Will Campbell rode out today’s 6.8 earthquake while on vacation in Thailand; only a native Angeleno would take something like that in stride. Re: speed cushions on Via del Monte. A couple of months ago, signs went up on Via del Monte announcing public hearings on installation of “traffic calming devices.” One of the cyclists I frequently ride with is on the traffic committee and we discussed the problem and how speed bumps could be dangerous to bike riders. A couple of weeks ago, the speed “cushions” were installed and I was very pleased to see slots were left between the three sections for emergency vehicles…and bicycles. I was dismayed to read about Richard’s accident at this site only a week later. I don’t know when lettering was first installed on the street, but there are now very large, white words warning of the speed bumps painted on the asphalt. Accidents happen; be careful out there; and get well soon, Richard. A few years back a guy I know who’s a very cautious rider had a similar accident when speed humps were installed on just south of the Greek in Griffith Park. The humps were installed but the workers left the signage and paint for another day making them virtually invisible as they were placed in a spot where there are always shadows. Luckily he “only” suffered a broken collarbone. Always a drag becoming the guinea pig by accident. Christ, doesn’t every planner in the developed world know that speed bumps don’t work? How are these dorks even getting degrees? I get that they have bike lanes and people suppose to be watchful of bike riders. But seriously you have to be crazy riding in the streets. I don’t trust fools in a 2 pound car. Let alone a 5lb bike. All in the turning lanes. Accident waiting to happen.